I've been looking around for some little girls' accessories as majority of my gift list are little girls from babies to toddlers. As I've young girls of my own I know how nice for little cutie girls to have pretty clips and headbands to accentuate pretty little dresses. As I'm always online I've found some colorful headbands at etsy.com, the home of handmade accessories. 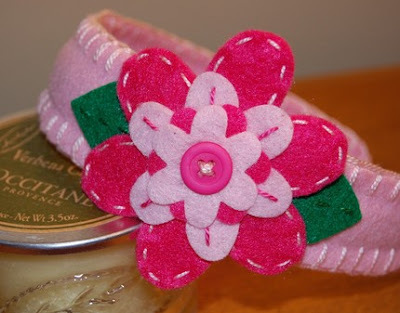 This felt headband was customized for cute little girls with lots of different stitches. It sells at USD$15.00. Visit them online and see other pretty flowers clips and headbands.